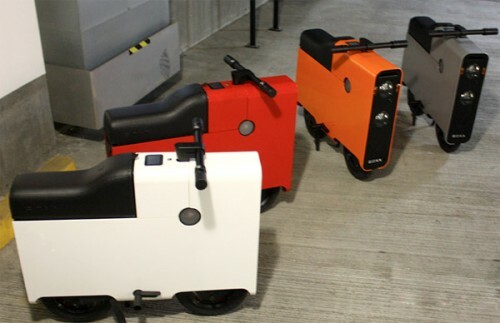 Boxx Electric Bike Looks Like A Suitcase, Seems Really Useful | OhGizmo! Try for a second to get past its strange appearance; this is an actual working electric bicycle with decent specs. On a standard configuration you will get 40 miles per charge. An upgrade doubles that. And the standard configuration charges the battery back up in 4 hours, the upgrade cuts that down to 1. The 1 meter sq. (36 inches sq.) device weighs 120 lbs and can carry a rider tipping the scales from 90-300 lbs. 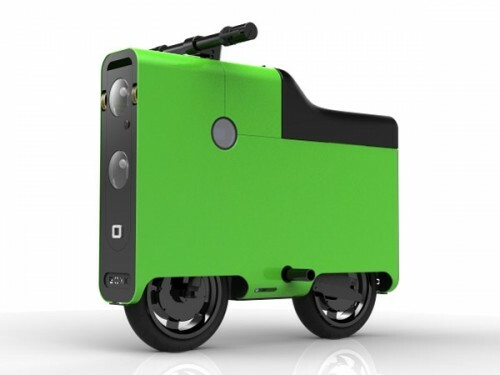 It goes up to 28mph to 35mph, a speed which is electronically limited depending on regional moped laws. The all aluminum construction features a glove box, a cargo bay, an all LED dot lighting system with hazzards. And the list goes on. This thing is pimped out. And it’s expensive. At $4,000 to start, this isn’t an impulse buy, but damn if you won’t be the coolest kid on the block riding around on this thing. And it does appear like it will be available this year.